Mr. Unnikrishna Pillai hails originally from Kerala , but has spent most of his career life in abroad -Republic of Yemen and sultanate of Oman. He has over 20 years of valuable experience in the field of education. While he has been a passionate and caring teacher, as an administrator he has been firmly result – oriented with a steady vision. His rich exposure to the CBSE curricula has empowered him with a diverse and innovative approach as an academic leader. He has conducted and attended several workshops and orientation classes in India and abroad. Apart from it, he has held position in CBSE examination conducting, evaluation and teacher training programmes. His writing on language, education phenomena and classroom management has published in journals of India and abroad. He has extended his service as a PGT English at New Look Sr. Sec. 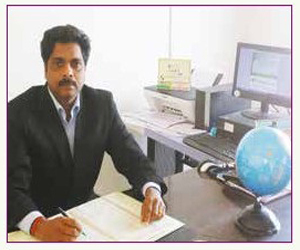 school Banswara , ( 1996 – 2001 ) ,Head of Department of English at Sree Niketan Central school & college, Kollam Kerala (2002 – 2006 ) ,Principal, Indian School Republic Yemen ( 2006 – 2010 ) Principal, Karuna Central school Kollam Kerela (2010 – 2011 ), Indian school salalah Republic of Oman ( 2011 – 2012 ), Principal at PRJ Gyanjaya Bewar ,Rajasthan ( 2012 -2013 ). From 2013 onwards he offered his great service as the Principal at Leo International School.